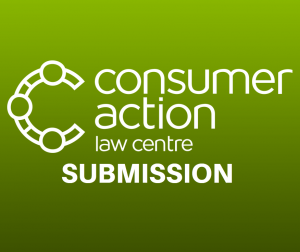 Consumer Action Law Centre (Consumer Action) welcomes the opportunity to provide input into The Treasury’s budget development for financial year 2016-17. The stated aim of the Government in inviting submissions to feed into the development of the 2016-17 Federal Budget is to focus on responsible expenditure. This also gives the opportunity to identify saving measures that will allow the focus of Government resources on the skills and jobs Australians need. Invest in financial counselling services to help Australians struggling with credit and debt get back on their feet, pay their way, and return to financial inclusion.